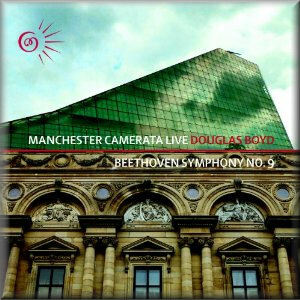 This new recording of the Ninth completes the Beethoven Symphony cycle of Douglas Boyd and the Manchester Camerata. Archivmusic.com lists 295 recordings of the Ninth. One might be forgiven for believing there is nothing new any conductor and orchestra can bring to this (or any) Beethoven Symphony. I am not one of those people. For me, Beethoven’s genius is such that no matter how many times I hear his music, if the performance is technically accomplished and musically thoughtful, there is always something new to discover. So it is with this performance. Douglas Boyd was Music Director of the Manchester Camerata from 2001 to the end of the 2011 season. So this recording, made in January 2011, is surely intended as a summation of what he accomplished as Music Director. The Camerata’s playing is certainly excellent; its 59 musicians play with vibrancy, intensity, and precision. One senses the players truly listening to one another; the interplay between the woodwinds and strings in Movement 1, as well as the cantabile string playing in Movement 3 are particularly fine examples. Before beginning his conducting career, Boyd served as principal oboe in The Chamber Orchestra of Europe for several years, where he played the Beethoven cycle under its two main conductors, Claudio Abbado and Nicholas Harnoncourt. I could not help but listen for their influence on Boyd’s interpretation. While I could credit the lightness of texture and rhythmic buoyancy to their influence, Boyd is very much his own man, with his own interpretative ideas. Boyd’s choice of tempos greatly contributes to the success of this performance. He seems intent on presenting the more lyrical writing in this score. I was repeatedly struck by the graceful melodiousness of the music. In Movement 1, Abbado and Gardiner (most especially) drive the music relentlessly, highlighting its aggressive elements. Adopting a slightly slower tempo, Boyd more fully realizes the music’s lyricism, without leaching power from the more explosive episodes. In the Trio of the Scherzo, Harnoncourt and Abbado set a frantic tempo that in the Harnoncourt performance sounds as if it might fall apart at any second. Boyd’s tempo strikes me as just right, allowing the winds to create a moment of repose before returning to A material. The third movement is rendered beautifully, its melodies given full rein, played with elegance and passion by the Manchester musicians. The final movement is not quite as successful. The opening dissonant chord is underplayed and lacks the shock that Järvi creates in his recent performance. The recitative for lower strings reveals one or two moments of volatility. “Ode to Joy” begins just a tad too slow, so that as the orchestral variations progress they never take wing. The soloists sing their roles well, particularly the men, though the soprano tends to shrillness above the stave. The first choral entry was something of a shock, with a sound that suggests the singers greatly outnumber the orchestral players. At first I expected to miss a Chamber Choir sound, but the excellence of the choral singing soon won me over. The final pages are wonderfully exciting, but missing that extra urgency that comes across so vividly in the Abbado and Järvi performances. Boyd’s accomplished performance offers a gentler, more graceful side to a Symphony that is all too often played without either. It is also an excellent record of his successful ten-year partnership with the Manchester Camerata.